The Bulgarian Cabinet has declared “absurd” a claim by the Bulgarian Orthodox Church, as represented by the Bachkovo Monastery, for the ownership of the famous medieval Asen’s Fortress located in the southern Bulgarian town of Asenovgrad. The ruling is revealed in a letter from the head of the political cabinet of Bulgarian Prime Minister Boyko Borisov to the Mayor of Asenovgrad Municipality Emil Karaivanov, Asenovgrad Municipality has announced. The letter is in response to a personal plea by Archimandrite Simon, the Father Superior of the Bachkovo Monastery, one of the most famous Bulgarian Orthodox monasteries, which is located near the town of Asenovgrad and Asen’s Fortress (Asenova Krepost), with Prime Minister Borisov for transferring the ownership of the archaeological site from the Asenovgrad Municipality to the Monastery. Asen’s Fortress dates back to the height of the Second Bulgarian Empire (1185-1396 AD) and the Asen Dynasty (1185-1256 AD), and is a major archaeological and historical site and a destination for cultural tourism. It is best known for the well preserved 12th-13th century AD Church of the Holy Mother of God, a two-story cross-domed single-naved church with a wide narthex and a large rectangular tower, with 14th century murals. The Bachkovo Monastery has had claims of the ownership of Asen’s Fortress, a major site for cultural tourism, for many years; it has also claimed a local road and a former student’s camp. 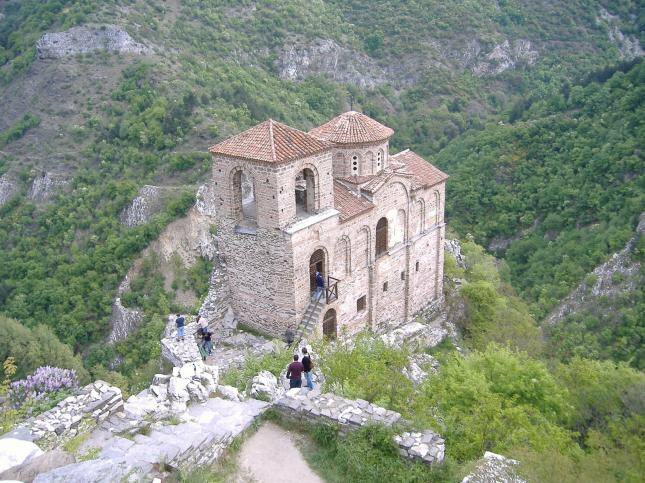 While the Bulgarian Cabinet has snubbed the Bachkovo Monastery’s claim of the ownership of Asen’s Fortress, it says that the other two claims can only be settled in court. After he was visited in Sofia by Archimandrite Simon, the Father Superior of the Bachkovo Monastery, Bulgarian Prime Minister Boyko Borisov at first said he had to support the claims of the church. However, Asenovgrad Mayor Emil Karaivanov has also paid him a visit, and has apparently managed to change his mind. Over the spring of 2015, a total of three landslides affected Asen’s Fortress, one of them destroying part of the road leading up to it. Asen’s Fortress (Asenova Krepost) is a medieval Bulgarian fortress near the southern Bulgarian town of Asenovgrad (which takes its name from the fortress). It dates back to the height of the Second Bulgarian Empire (1185-1396 AD) and the Asen Dynasty (1185-1256 AD). Asen’s Fortress is located on a 300-meter-high isolated rock, on the northern slope of the Rhodope Mountains. Its location features traces of Neolithic, Ancient Thracian, and Byzantine settlements. It was mentioned as Petrich (not to be confused with today’s town in Southwestern Bulgaria) in an 11th century statute of the nearby Bachkovo Monastery. Asen’s Fortress was conquered by crusaders from the Third Crusade. It was renovated in 1231 AD during the reign of Bulgarian Tsar Ivan Asen II (r. 1218-1241) as a stronghold against the Crusaders’ Latin Empire (1204-1261). It is best known for the well preserved 12th-13th century Church of the Holy Mother of God, a two-storey cross-domed single-naved church with a wide narthex and a large rectangular tower, with 14th century murals. Asen’s Fortress was captured by Byzantium after Tsar Ivan Asen II‘s death, and regained by Bulgaria in 1344 under Tsar Ivan Alexander (1331-1371). It was conquered by the Ottomans Turks during their invasion of Bulgaria at the end of the 14th century even though the church remained in use during the following centuries. According to some sources, the fortress was destroyed in the Ottoman Interregnum when Ottoman princes fought for the succession of the Ottoman throne (1402-1413 AD).